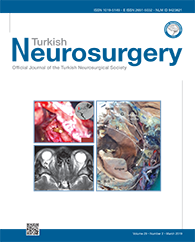 1The First People?s Hospital, Neurosurgery Clinic, Kunshan, China DOI : 10.5137/1019-5149.JTN.19747-16.2 AIM: To evaluate the surgical treatment of chronic subdural haematomas (CSDH), we compared two surgical treatments of CSDH; burr-hole craniostomy irrigation with and without drainage. MATERIAL and METHODS: We retrospectively studied patients with chronic subdural haematomas admitted to our hospital. A total of 87 patients underwent surgery: 57 were treated via burr-hole irrigation with postoperative drainage (Group BD) and 30 were treated via irrigation without drainage (Group BI). RESULTS: Two instances of rebleeding developed in Group BD. The cerebral cortex did not expand in one case. One instance of rebleeding developed in Group BI but the cerebral cortex expanded in all cases. The average length of hospitalisation, number of postoperative complications, incidence of rebleeding, and extent of expansion of the cerebral cortex did not differ between the two groups (all p values > 0.05). At the 6-month follow-up, most patients had recovered well. The Glasgow Outcome Scale (GOS) revealed no significant differences between the groups. No significant difference was found between the two surgical treatments in terms of the length of hospitalisation, rebleeding, or expansion of the cerebral cortex (which was complete in all but one patient).